New company, Antenna Engineering has recently started trading through their online shop, which is an exciting undertaking for recent graduate Henry and his father, Chris (G4AMN), who has over 40 years experience in the industry and as a amateur radio enthusiast. 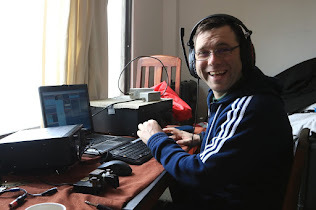 Sheffield Hallam Engineering Graduate (2009), Henry Wainwright, has started his own company manufacturing amateur radio equipment with the support of the University’s Graduate Entrepreneurship Scheme (GRADE). The company, Antenna Engineering (based in Leicestershire & South Yorkshire), has a comprehensive range of amateur radio antenna equipment ranging from mono-band single element verticals to multi-element phased arrays. Antenna Engineering produces a high performance range of vertical antennas for the serious DX enthusiast. More information on all of Antenna Engineering’s products can be found at www.antennaengineering.co.uk.